Recent data from the Bank of Spain shows that Spaniards still prefer owning their home over renting by a wide margin. The percentage of owner-occupying families in Spain rose to a peak of 85% in the boom year of 2004, leaving just 15% of households living in rented accommodation back then. Compared to other countries like Germany, where a majority of families rent, Spain looks fanatical about property ownership. How has a massive housing bust changed attitudes towards home-ownership in Spain? Not much, it seems. Half a million families have lost their homes, and house prices have collapsed by between 30% and 50%, depending on who you ask, but the vast majority of Spaniards still prefer buying over renting. The percentage of owner-occupiers has declined slightly over the crisis years, from 85% in 2004 to 77% in 2013, in part due to the number of people who lost their homes to repossession, but then rose again to 78% last year. 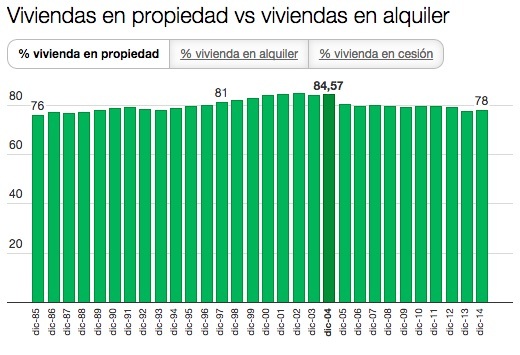 Spain is still a country with an unusually high level of home ownership. As one commentator put it, the property crash hasn’t managed to uproot the spanish preference of buying over renting.